Jesse M. Hinshaw1,7 [Jessee Hinshaw6, Jesse Henshaw8,9, John Henshaw2]. He married Sallie E. Roup1,8 [Sarah Elizabeth Roup5,8,9,12,13,14,15,16, Anna Roupe2], Jan 13 18561,8, Jackson County, Missouri1,8. Sallie, daughter of John Roup & Isabel Davis4,5,12,16,17, was born Apr 30 18374,5,12,16,17, Tennessee4,5,12,16,17 [Indiana18]. J. Hinshaw, age 25, born in North Carolina; farmer. Sarah Hinshaw, age 23, born in Tennessee. M. Ann Hinshaw, age 3, born in Missouri. Mary Green Hinshaw, age 1 month, born in Missouri. Hinshaw, Jessie, age 35, born in North Carolina; farmer; $1075 real estate; $300 personal property. Hinshaw, Sarah, age 33, born in Tennessee; keeping house. Hinshaw, Martha A., age 13, born in Missouri; attended school. Hinshaw, Mary G., age 10, born in Missouri; attended school. 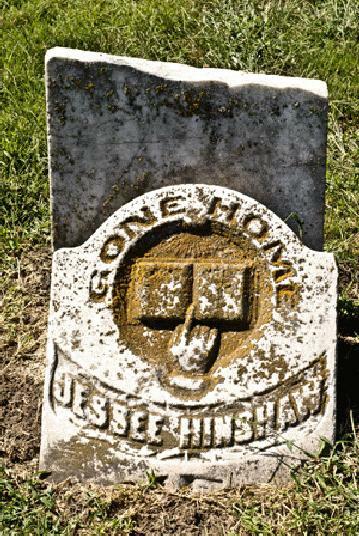 Hinshaw, John T., age 8, born in Missouri; attended school. Hinshaw, Sarah J., age 5, born in Missouri. Hinshaw, Elizabeth F., age 3, born in Missouri. 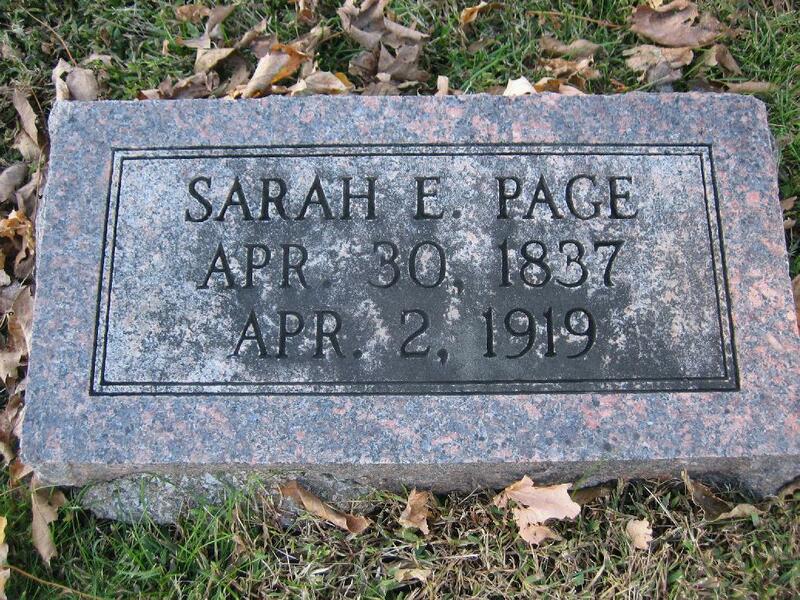 After Jesse died, Sarah remarried to a John Page18 (apparently about 1873 to 1880). Page, John, age 45, born in England; parents born in England; farmer. Page, Sarah, wife, age 43, born in Indiana; father born in North Carolina; mother born in Tennessee; keeping house. Page, Barton, son, age 4, born in Missouri; father born in England; mother born in Indiana. Page, Reed W., son, age 6 months, born Dec  in Missouri; father born in England; mother born in Indiana. Hinshaw, Florence E., step daughter, age 13, born in Missouri; father born in North Carolina; mother born in Indiana; single. Oldham, Walker, age 24, born in Missouri; father born in Kentucky; mother born in Tennessee; single; works on farm; has fever. Page, Bart E., head-of-household, age 23, born Dec 1876 in Missouri; father born in England; mother born in Tennessee; single; occupation: blacksmith; owned home (free). Page, Sarrah, mother, age 61, born April 1839 in Tennessee; parents born in Tennessee; married 3 years; 5 children, 5 living. Page, Reed H., step-brother, age 19, born Dec 1880 in Missouri; father born in New York; mother born in Michigan; single; occupation: blacksmith. Henshaw, John, nephew, age 16, born April 1884 in Missouri; parents born in Missouri; single; attended school 9 months. Page, Reed H., head-of-household, age 29, born in Missouri; parents born in Missouri; first marriage, married 4 years; occupation: blacksmith, blacksmith shop; owned home (free). Page, Erma, wife, age 29, born in Missouri; parents born in Missouri; first marriage, married 4 years. Page, Sarah E, mother, age 73, born in Kentucky; parents born in Kentucky. Martha Ann Hinshaw death record. 1860 census, Pleasant Hill P.O., Big Creek Township, Cass County, Missouri; page 883, line #30, dwelling #1297, family #1297. 1870 census, Pleasant Hill P.O., Polk Township, Cass County, Missouri; page 681A, line #25, dwelling #51, family #48. Birthdate calculated from age at death on gravestone. Jackson County, Missouri Marriages, 1827-60, Vol. 1; http://www.ancestry.com. 1900 census, Slater, Cambridge Township, Saline County, Missouri; roll T623-901, ED 123, page 17B, line #75, dwelling #392, family #393. 1850 census, Van Buren Township, Jackson County, Missouri; roll M432-402, page 355A, line #34, family #1681. 1880 census, Polk Township, Cass County, Missouri; roll T9-0680, ED 93, page 240D, line #20, dwelling #178, family #189. 1860 census, Pleasant Hill P.O., Big Creek Township, Cass County, Missouri; page 883, line #34, dwelling #1298, family #1298. 1870 census, Pleasant Hill P.O., Polk Township, Cass County, Missouri; page 681A, line #1, dwelling #48, family #45. 1880 census, Polk Township, Cass County, Missouri; roll T9-0680, ED 93, page 240D-241A, line #48, dwelling #182, family #193. 1910 census, Slater, Cambridge Township, Saline County, Missouri; roll T624-823, ED 165, page 12A, line #27, dwelling #675, family #696. 1910 census, Slater, Cambridge Township, Saline County, Missouri; roll T624-823, ED 165, page 35A, line #9, dwelling #675, family #696.